Nach dem in der ganzen Welt die Story bekannt wurde, werden die Fragen immer mehr. FLYING führt 5 Gründe an, um es skeptisch zu sehen und welche in der "Schlagzeilen-Welt" im Moment noch unter gehen. Even if you want to believe, here’s where the paper’s reporting on the Pentagon’s secret UFO program falls short. That New York Times story about a secret government UFO program and close encounters between Navy airmen and unexplained flying objects over the vast Pacific Ocean reads like a science fiction story. Which was how the paper wanted it. Scratch beneath the veneer of the borderline-sensationalist reporting and we’re left with many more head-scratching questions than answers. The eyewitness account of former F/A-18 Super Hornet pilot David Fravor is certainly intriguing — and yet he wasn’t even a part of the original Timesstory, which focused on the money trail behind the UFO hunting effort and interviews with those who are “absolutely convinced” that aliens exist and that UFOs have visited Earth. The Times story touched off a flurry of breathless reporting by media outlets around the world, most of which seem to have failed to notice that the Times’ original reporting has some major problems with it. Here are the five of the most glaring. 1. The Pentagon didn’t release those UFO videos, an official connected to a Las Vegas company who resigned in October did. 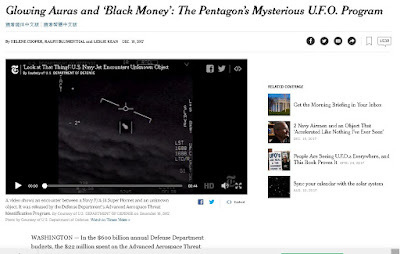 The New York Times story makes it seem as though the release of the videos came from high-level government officials, glossing over the information that the disclosures were actually spearheaded by an official who led the Pentagon's relatively small UFO hunting program and who has since resigned to join a Las Vegas company called To the Stars Academy of the Arts and Sciences that is seeking private funding for more UFO research. That’s a major distinction that most in the media appear to be ignoring since the original Times report appeared. 2. The Pentagon UFO program’s prime contractor claims to possess mysterious metal alloys that exhibit mystical powers — but won’t show them to anyone. Bigelow Aerospace, another Nevada-based company, which received most of the Pentagon funding for the UFO research project, reportedly collected mysterious alloys from UFOs that physically affected people who interacted with them. Never mind there are obvious conflicts of interest between Bigelow Aerospace’s billionaire founder Robert Bigelow and his friend, former Nevada Sen. Harry Reid, who pushed for the $22 million in funding for the government’s UFO program in the first place — what we want to know is, why all the continued secrecy surrounding these alloys and other UFO findings? 3. One of the authors of the Times article wrote a book about UFOs and doesn’t even work for the paper. 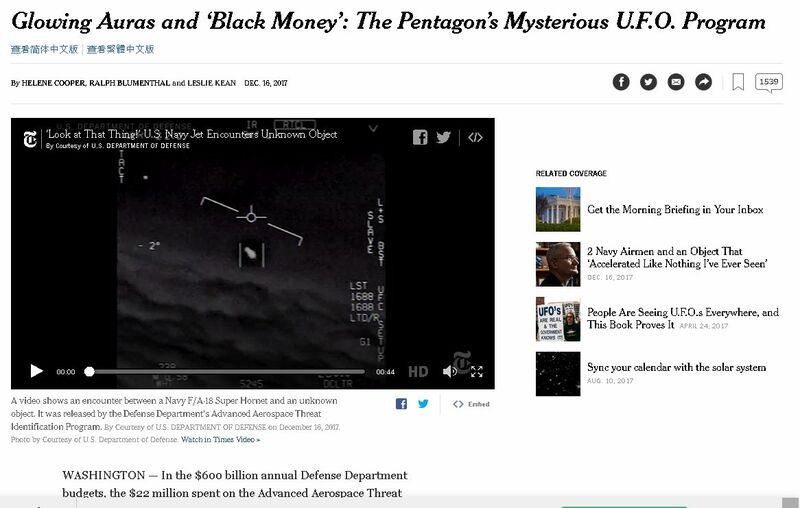 After its UFO story appeared in its Sunday edition, the Times divulged that one of the bylined authors wasn’t an employee of the paper but rather is a UFO hunter named Leslie Kean who has written a book on the subject with a forward by John Podesta, another well-known UFO conspiracy theorist who used to throw “X Files” viewing parties in the White House when he worked there during the Clinton years. In fact, not only did Kean help write the article, she was the one who pitched the story to the Times in the first place. At best, shouldn’t she merely have been interviewed for the story? Why was she permitted to be a part of the writing and vetting process? 4. In one of the videos, a Navy airman says “That's a [bleeping] drone.” Why are we doubting him? In the only UFO video released with pilot audio accompanying it, a Navy airman describes the object he is following as a “drone.” The object does not appear to do anything particularly unusual in this video. Nobody claims that the object did anything unusual. The Pentagon won’t even say where and when the video was shot. Was it a drone? 5. There are plausible explanations for these videos and eyewitness accounts. Where is the rest of the evidence? Far from proving that our planet has been visited by aliens in aerodynamically advanced space craft, the videos and eyewitness accounts that emerged in the Times story and elsewhere merely provide a starting point for further investigation and inevitably lead to more questions. That’s what makes all of the secrecy and intrigue still surrounding this story so frustrating for the public. The New York Times has dangled this carrot in front of the world, and now leaves us all wondering if the people who claim to know more will ever divulge that information, or merely continue to direct us to the “Donate Here” buttons on their websites. GIMBAL is the first of three US military videos of unidentified aerial phenomenon (UAP) that has been through the official declassification review process of the United States government and has been approved for public release. So we're not looking at something They didn't want us to see which Tom DeLonge obtained by some clandestine or illegal means in a Cosmic Watergate scenario, which is how he previously implied his fearless whistleblowing crusade would achieve its promised mind-blowing revelations. It's not even classified, and if anything on it was ever secret, those bits were cut out before anybody in Tom's crowd saw them. So if the remaining footage shows a heavily censored but still top secret encounter between the USAF and an alien spaceship, why would it be released at all? What I'm thinking is that this is just a clip from some otherwise routine exercise cherry-picked because those 34 seconds can in isolation be interpreted as a flying saucer, though if we saw the unedited footage and/or knew what its original context was, it would become obvious that no extraterrestrials were involved. For which reason somebody has edited it. Look at the way it starts after they've already locked onto the UFO. Why not show the plane approaching? Perhaps because from a different angle that thing isn't shaped the least bit like a flying saucer? And why does the video suddenly end just as the object starts to do anything other than fly in a straight line at a constant speed? Same reason, perhaps? If Tom & Co. honestly think they've got a real video of Earth vs the flying saucers, why not publish every single frame? In particular, the American pilots presumably didn't chase that thing forever, so how did they lose it? Did it suddenly make a right-angle turn and zoom off at hypersonic speed? Or maybe it simply vanished into hyperspace? If this video showed anything like that, you guys would have a lot more trouble explaining it away as a misleading IR image or whatever! Has it occurred to anyone to try and enhance the sound? Just before it ends, the dialogue can't be fully made out, but one pilot obviously says "That's not (inaudible) is it? ", and the other one replies "It is (inaudible)". To my ears, that exchange sounds as though it could be Q: "That's not our own (inaudible) is it?" A: "It is our own (inaudible)". Even if I'm wrong about that, it does sound as though these two men have figured out what they're looking at, and it's very odd indeed that they're cut off the moment they start talking about it, and before they can clearly say what they think it is. So has anyone here got some top-notch audio software they can run this through? "That's not hailing us though is it? or "That's not L.O.S. though is it?" "I do...they on us dude"
About the audio, this bit on Quora sounds reasonable. The L&S, in Hornet parlance, is the “launch & steering” target, in other words, what the radar is pointed at. He’s asking if the radar and the FLIR are looking at the same thing (“correlated”), and the other pilot was confirming it. That makes a lot of sense. I guess the "fleet" they saw on the radar and what they were seeing through the camera were connected after all. It means one of them thought they were, assuming the audio interpretation is correct. hanks for that information. I have no knowledge of the jargon used by USAF pilots so I couldn't guess what they might be saying. Though oddly, neither could the folks at TTS, since although their video is subtitled, those words are given as (inaudible). Meaning that: A) They don't have a written transcript of the audio, so their file on the incident is very far from complete. B) They didn't think it was worth the effort to figure out trivial little details like what the witnesses to the most important thing ever were actually saying, even though the USAF is so large that people who at least understand their jargon aren't that hard to find. As it turns out, the exact words probably don't matter. But if TTS are always going to be this lazy about doing any research at all before bunging their wondrous discoveries out there, things like this are worth checking. Those half-inaudible words could have been the solution to the whole mystery. They weren't, but next time they might be. Since we don't know how the encounter began or ended, when and where it took place, and what the circumstances were, numerous explanations are possible, and only one of them involves space aliens. For example, if, as a previous poster suggests, the hi-tech sensor pod the pilots were using was brand new technology, those men may not have been up to speed yet with how the world looked through their fancy new scope, and misidentified something quite ordinary. Or perhaps there was a weird glitch that sometimes made UFO-like objects appear on the screen, which has now been corrected. Since the context in which this clip was shot is still apparently classified but the clip itself is not, one possible explanation for it being a somewhat random bit of footage with no beginning or end is that it was selected to be shown to the engineers so that they could see exactly what the problem they were supposed to fix looked like. Personally I think the clip is most consistent with this being footage of an exercise, possibly to test how effective the new sensors would be in combat. It would make sense for pilots to be sent up to look for an unspecified target, and for them to be distracted by decoys from a "hostile" played by one of their own aircraft, which would try to escape and would not of course be in radio contact with them. Decoys, particularly electronic countermeasures that show up on radar but don't physically exist, would be consistent with the airmen detecting "a whole fleet of them" but only seeing one. It sounds as if maybe they jumped to the conclusion that all the radar targets were real, and because there were so many of them they must be drones, therefore the fighter they were chasing, which looked odd on the IR screen but was actually identical to their own plane, was a state-of-the-art robot. Maybe they'd just seen Green Lantern. All of which is pure conjecture. But in the absence of a great many important pieces of the puzzle, definitively proving or disproving any plausible theory is impossible. And explanations which, like mine, only involve things which are firmly established to exist are intrinsically far more plausible than those requiring extraterrestrial spacecraft. In the audio, one of them says "It's rotating". Do we think that he was unaware of what engine glare looks like through FLIR? Yes. It looks different depending on the condition of the the glass. 3) The camera loses lock due to turbulence, and the change in camera causes a change in the shape of the IR flare. What are you basing that on? The Raytheon sales video? So we're straight-up saying that we don't believe the pilot or WSO were familiar with what jet engines look like on FLIR. Yes, but it's more of a hunch. After posting this comment I noticed that the artifact video shows different rates of rotation. So there's no real clean comparison available. Regardless of the above, what strikes me is that the artifact rotations and the vibrations of the camera system are precisely synchronous. There appears to be a direct correlation. The video should be sharp enough to measure both and plot on a time axis. Would the pilot have sounded surprised, and have provided quotes to the NYT about the 40ft tic tac, if he'd merely been talking about IR glare from a jet engine, or the FLIR pod rotating? Well no, of course not. It seems rather narrow then to consider the IR footage but without reference to the pilots who were chasing the object purportedly shown in it. The provenance of the gimbal video is unknown. There is no pilot testimony associated with it. Following up on the media's DeLonge Overload we wrote about three days ago, there is a lot to report. The program collected video and audio recordings of reported U.F.O. incidents, including footage from a Navy F/A-18 Super Hornet showing an aircraft surrounded by some kind of glowing aura traveling at high speed and rotating as it moves (emphasis added). This struck me as a monumentally stupid thing to say, especially since a "glowing aura" was also visible in the "Groundbreaking" Chilean Helicopter Infrared video released by the "experts" in the Chilean government UFO investigations, that Leslie Kean (one of the authors of the current New York Times article) promoted so eagerly. (In that case, the "aura" was called an "envelope".) That video has conclusively been shown to depict a distant jet aircraft whose position had been misjudged. An image from the "Groundbreaking" Chilean UFO video promoted by Leslie Kean in January 2017, later shown conclusively to be a distant jet aircraft. Kean's Chilean "expert" labeled the object's "envelope" (envoltura). I know exactly what the glowing aura is....it is a common image processing artifact called "ringing"....Frankly, I'm surprised the ATFLIR has it, we worked hard at [my previous company] to mitigate/eliminate this artifact. When in "white Hot" you will see that the aura around it is dark, and when in Black hot, it is brighter than the background. This is the image processing algorithm compensating for the large signal on neighboring pixels where the signal is not there, the algorithm doesn't know the shape of the object, and over-processes the neighboring pixels. Very common when an object (like jet engines) are images over a cold background (like high altitude clouds). So when various UFO "experts" talk about a "glowing aura" surrounding the objects, they are in fact admitting, "We don't know anything about infrared imaging, and we did not consult with anyone who does." Miller says that the objects are likely distant jet aircraft, but we can't see them clearly enough to be sure. Which is itself an interesting question - why is the quality of these videos so terrible? What perplexes me (and is telling) is why all these IR UFO videos have such lousy quality. Modern IR images look like Hi Def black and white TV. All of these are out of focus, need uniformity correction and generally are crap. We should be able to make out a shape and even count the engines, or see landing gear if deployed. A sales guy would never show a prospective customer anything like these. Very good observations, indeed! Why are there no good, clear infrared images of UFOs, in sharp focus? 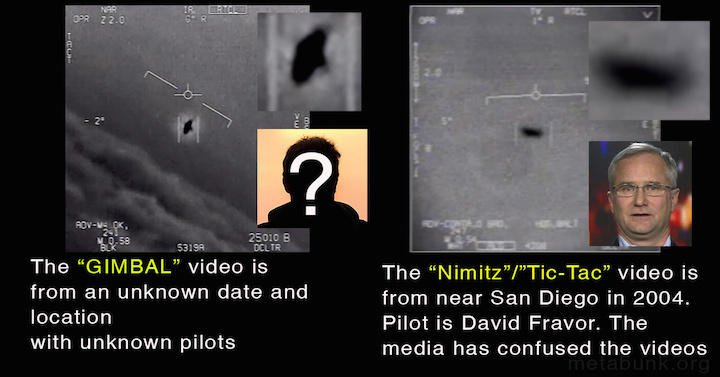 One of the two Infrared videos recently released by the Pentagon is labeled by DeLonge as the "Gimbal video." He writes that "The filename “GIMBAL” seems to be traceable to the unusual maneuvering of the UAP," thereby proving that he has no idea whatsoever what he is talking about. Miller explains that "Gimbal is just a generic term for any electo-optical system (infrared, visible or laser) that has a two dimensional pointing mechanism." Bigelow's company modified buildings in Las Vegas for the storage of artifacts gathered from UFOs? That does not seem to be possible, but that is exactly what the Timesstory says. How many tons of alleged UFO artifacts must Bigelow have to need to modify buildings to store it? Speaking of alleged UFO artifacts in Las Vegas, I wrote in my Psychic Vibrations column (Skeptical Inquirer), January/February, 2013, concerning a UFO discussion panel held at the The National Atomic Testing Museum in Las Vegas. They had a special exhibit on "Area 51." 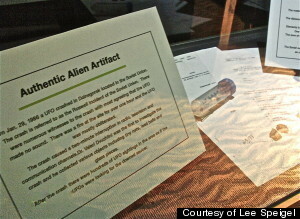 During the question and answer session, Las Vegas skeptic John Whiteside asked about the supposed “authentic alien artifact” in the Area 51 exhibit. The moderator referred the question to reporter George Knapp, in the audience, who (scandalously) was the source of that “artifact.” Knapp has made a career out of reporting on weird stuff like alleged saucers at Area 51, Robert Bigelow’s Haunted Ranch in Utah, etc. Who had verified that supposed artifact? The Russians, and others. Who exactly? No answer. The moderator encouraged the two to take the discussion off-line afterwards. Immediately after the close of the questions, Whiteside says he was approached by Jim Brown who identified himself as the Acting Director of the Museum. Brown berated him for asking such a question, claiming that it threatened their funding. If a Museum’s funding is threatened by asking a legitimate question, the fault lies not with the questioner, but with the Museum. Whiteside went looking for Knapp after this, no more than five minutes later, to find that he had quietly slipped out the door. I'm thinking it's very likely that this was one of the same "UFO artifacts" that Bigelow had. If so, one would scarcely need to modify any buildings to house it. Lee Speigel's photo of the supposed "Authentic Alien Artifact" in the Area 51 exhibit of theNational Atomic Testing Museum in Las Vegas. Mr. Bigelow did not fund MUFON’s work for BAASS, instead “sponsors” that Bigelow revealed to John Schuessler but not to the other MUFON Board Members put up the money. John Schuessler, MUFON Board Member and former International Director was offered a U.S. government security clearance allegedly related to his consulting work for Mr. Bigelow. Now whether John was actually given that clearance, I can’t say for sure, but I was one of the people interviewed as part of his background investigation. From which we can reasonably conclude that John Schuessler did know that MUFON was receiving federal funding through Bigelow, but other MUFON officials did not.